It’s no secret that placing implants requires a fair amount of planning and consultation before any step can begin. The good news is Dr. Feit is an expert prosthodontist with over 30 years of experience under his belt! This makes him a unique asset to those in need of high-quality restorations that function for many years to come. His training paired with some of the best oral surgeons in the area only provides additional reassurance that your implant treatment will be a success. To schedule your implant consultation, contact our office today! During the consultation, you’ll get a chance to speak with Dr. Feit about what your goals are with dental implants. These include the number of teeth you intend on replacing, the type of restorations you’ll need, and your eligibility to receive implants based in your current oral health status. For example, if you have insufficient bone tissue and unhealthy gums, then a bone graft or periodontal therapy will be required before going forward. Once we’ve effectively planned your implant surgery, we’ll schedule you to have the titanium post/posts placed inside your jaw. You’ll receive local anesthesia to ensure comfort, however we also offer sedation dentistry if you have any anxiety prior to treatment. The length of surgery can vary depending on the complexity of your case, but the oral surgeons Dr. Feit partners with should put you at ease. Following your surgery, you’ll need to wait several months for the implant to heal. During the healing stage, which can take anywhere between four and six months, the titanium post will undergo a process known as osseointegration. This process refers to bone tissue that heals around the biocompatible implant post. 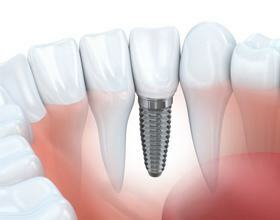 Once we’ve confirmed that the implant has fully healed, we’ll place an abutment on top. This is where your restoration, whether it’s a crown, bridge or denture, will attach. Dr. Feit will take an impression of this abutment in order to create the restoration. Over the next couple of weeks, the gum tissue will heal around the implant. As a prosthodontist, Dr. Feit is not only educated on creating the most natural-looking restorations. He’s also dedicated to ensuring that they provide the best function and comfort possible. 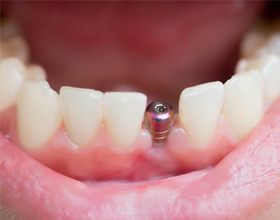 After your implant has fully healed, he’ll place your custom-made crown, bridge or denture and confirm that your bite is as even as possible. 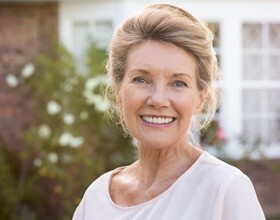 Ensuring an even bite is crucial to providing long-term oral health and preventing complications later.